We are continuing on our 30 days of prayer journaling journey. If you’re just joining us today is Day 7 in a series of 30 days of prayer journaling prompts. You can find Day 1 here and a summary of all 30 days will be here as we go along. 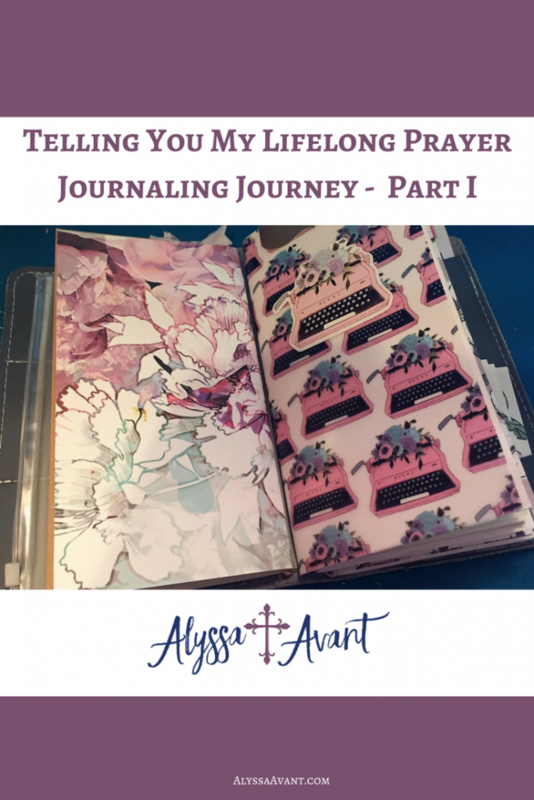 Now let’s continue with my prayer journaling story. I hope you’re enjoying it. At that time, I willingly and knowingly went against the wishes of my parents and at the urgings of an incredibly influential, extremely negative older guy entered into a relationship with him. This relationship led to a string of lies fed to my parents by not only me but my friends as I attempted to cover up the harsh reality that had become my life. After months of late-night phone calls that I was never supposed to make, visits from the guy without supervision that were never supposed to occur and a near life-changing event that was only stopped by sheer panic, my parents finally discovered what was happening. Thanks to Godly parents, I was blessed to end that dangerous defiance right there, nipping my rebelliousness in the bud. Their loving influence and hard discipline steered me back onto the proper path. Prior to this, I had been writing in a journal of sorts, yet the entries were full of stories detailing my rebellious, dangerous activities. These hand-written recordings of my escapades are actually what led my parents to discover my rebellious nature and call my hand on it. Therefore, when my mom gave me a new journal that Christmas I was hesitant to even use it. 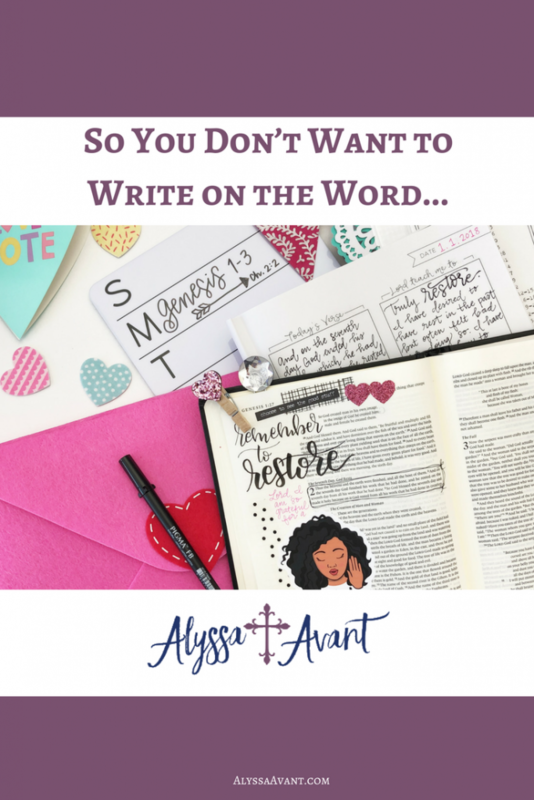 Yet then I remembered learning about keeping a prayer journal as opposed to a typical diary-type journal and I began to feel God calling me to write in this new way. 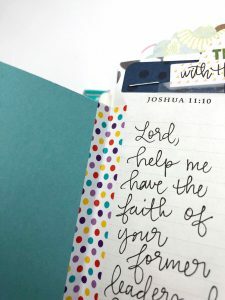 This prayer journal concept involved writing down feelings, thoughts, dreams and written prayers that you would share with the Lord, much like writing a letter to Him. I began to get excited about this idea, as I had already poured out my heart to God at the altar at church one Sunday. I walked the aisle and confessed my backslidden, rebellious choices, ways and rebellion to my pastor as a way of confessing before men what I had done. 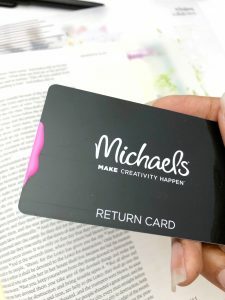 Writing prayers instead of accounts of my daily habits was not only just an intriguing concept to me but one I felt would prove to be much a more worthwhile and safe idea. I will continue this story tomorrow so be sure to come back . . . If you missed the first part of this story you can find part one here. Today’s Prayer Journaling Prompt: Record the things that inspire you the most. Maybe you have just met someone inspirational lately. What makes them inspiring to you? We are continuing on our 30 days of prayer journaling journey. If you’re just joining us today is Day 5 in a series of 30 days of prayer journaling prompts. 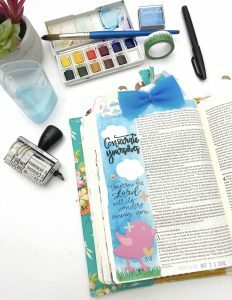 You can find Day 1 here and you can find a summary of all the prayer journaling prompts as well. 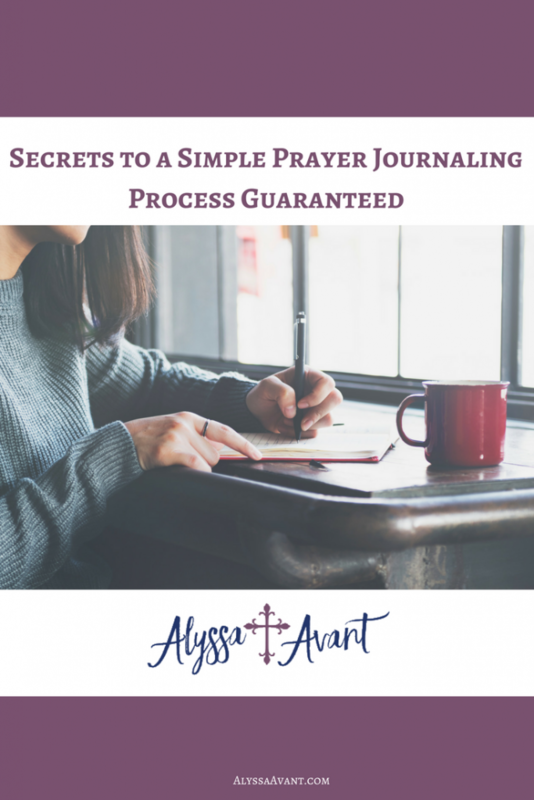 I know we’ve been talking about prayer journaling for five days now, but I thought you might appreciate a few more tips, these are my secrets to a simple prayer journaling process which are guaranteed to help you become an avid prayer journaler. Beginning the process of journaling is simple. As a Christian for 28 years, I have spent much time in prayer and have used a prayer journal for the majority of those years. It took some time to develop a technique, which I was comfortable with, however over the years I have finally developed a proven technique so easy and encouraging, that I still use it today. I begin my quiet time each day by using my prayer journal. This begins with simply writing out my thoughts and feelings about the day, struggles I am going through, things that are worrying me, things that I am excited about, anything and everything that is on my mind. This can be very freeing and soothing to do. 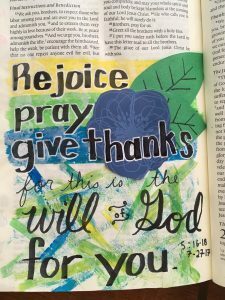 I then take time out to either write down my prayers in a bulleted list form by topic or in a more of a phrase form, such as “Help me Lord to rely on you for my needs.” After doing this, I feel that it is also important to give God thanks and to praise Him. Therefore, I do the same thing with a list of thanksgivings and praises. I attempt each day to thank and to praise God for as many things or more than I asked of Him. Finally, I present this to God in silent prayer and ask Him to lead me and guide me in my devotional time. 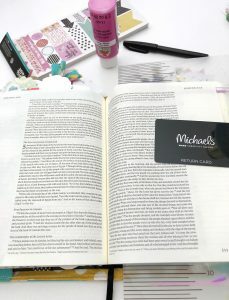 For my devotional time, I usually try to read both from the Bible itself and often times from an encouraging devotional or inspirational book. I draw from the reading what I feel God is attempting to tell me and I record in my journal these thoughts. 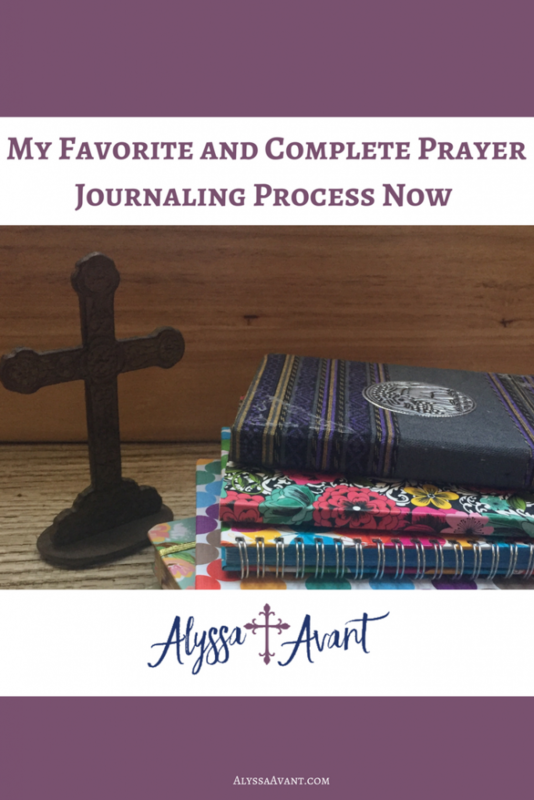 I hope that these simple instructions will help you to begin your process of prayer journaling. It is my prayer that you will not only fill this journal but that you will need many others in your future relationship with the Lord. Today’s Prayer Journaling Prompt: Journal about your weaknesses. Does it bother you that these things are your weaknesses? How do you deal with them and overcome them? We are continuing on our 30 days of prayer journaling journey. If you’re just joining us today is Day 3 in a series of 30 days of prayer journaling prompts. You can find Day 1 here and a summary of all 30 days will be here as we go along. Do you have habits in your life? Whether they be good habits, like going on a daily walk or bad habits like biting your nails we all have habits in our lives. Today, we are going to talk about how to make prayer journaling a daily habit in your life. Daily writing in a journal can be a difficult habit to form, but once you do, it can become addictive. I started journaling around 1994 when I was only a teenager and I haven’t stopped since. Some habit huh? Many people say that they enjoy journaling because it allows them to freely release their thoughts and feelings. Therefore, what could be a greater way to release your frustrations or record your victories than to start journaling? Some people like the idea of others being able to one day read their entries and admire their accomplishments and struggles while others loathe the thought of someone else ever reading their recorded thoughts. Well, if you want someone to read them, pass them on to them, however, if you do not just destroy them after you’ve filled the journal to the brim with entries. Either way, do what works for you. 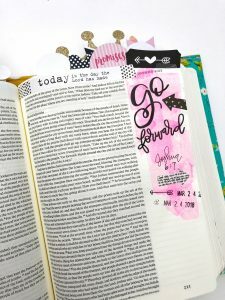 Why not try to develop a new and very worthy habit by making journaling a part of your daily routines, specifically a part of the time you spend with the Lord. Set up a specific time to journal each day. Habits are easier to keep up if you prepare for them ahead of time. I do my quiet time early in the day each day. 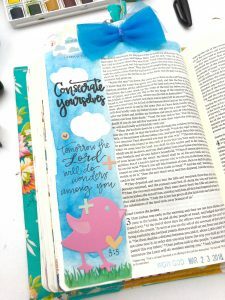 Setting a specific time for your prayer time is key to developing a positive habit of writing in a prayer journal daily. Have a dedicated place for your prayer time. This might be a comfortable chair in the corner of your bedroom, a swing on your front porch, or somewhere else around your home. 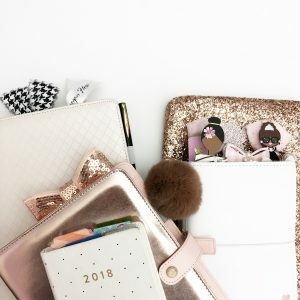 However, preparing a basic of your resources for writing in a journal daily and having a dedicated space that you can look forward to going to each day to write can help you to develop prayer journaling into a daily habit. 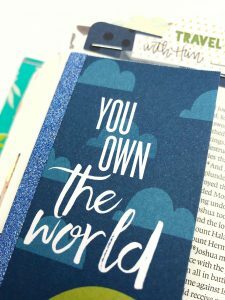 Today’s Prayer Journaling Prompt: Describe the worst feeling in the world, the one thing that makes you feel the worst. Then write about how you deal with that feeling. You might also be interested in getting your own 30 Days of Prayer Journaling Prompts journal to help you follow along with this series. These are available in both printable and hard copy. 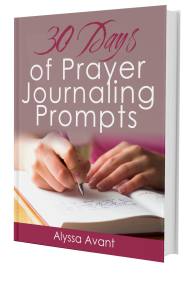 You will have everything you need all in one place to get started with the practice of prayer journaling. 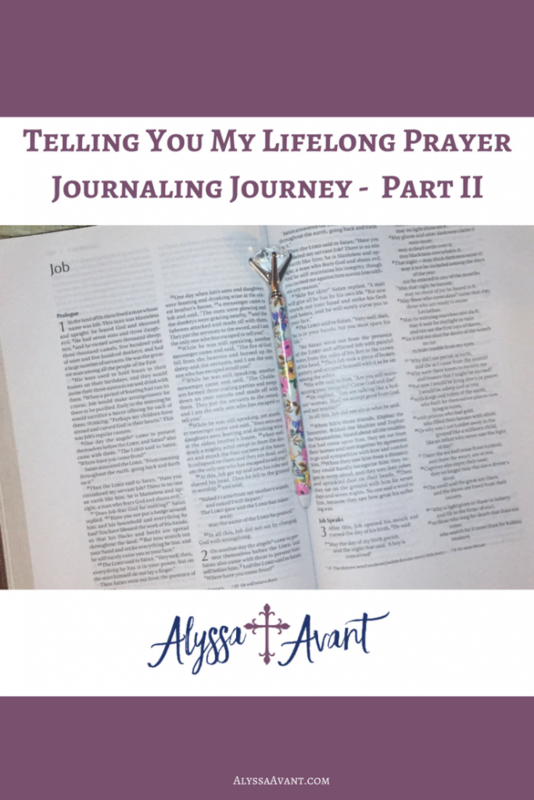 We are continuing on our 30 days of becoming an avid prayer journaler journey. 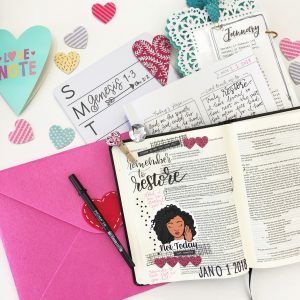 If you’re just joining us today is Day 2 in a series of 30 days of prayer journaling prompts that are meant to help you become an avid prayer journaler. You can find Day 1 here and a summary of all 30 days will be here as we go along. Remember, developing a habit can take 21-30 days. So why is it so hard to develop a habit, but we have some habits we do not even know how we formed such as nail biting or teeth grinding? Strange huh? One habit that I have developed over the years is the habit of journaling. Journaling is a pastime of mine that I truly enjoy and have formed a habit of doing. I have a huge stack of journals from my past that holds memories that otherwise I may have forgotten. Sure, I do not spend a lot of time going through the journals but I do from time to time look back especially on the previous year’s journal to see where I have come from, goals I have accomplished, prayers that have been answered. Prayer journaling is a process that I enjoy. Journaling is something that you can do no matter what your mood. I find myself not only journaling when I am happy but also when I am upset about something. I can literally fill pages and pages when my stress levels rise. Oh, what a release it can be! Looking back over the years though, I realize that I have used my journal more when I needed that release. Stressful times in my life I filled journals much faster. To date, my most stressful time was when I was in the midst of a bad situation at my job. I literally filled a journal full in 3 months, but what wonderful self-therapy it was. I realize reading the entries later that if it were not for that time I took to sit down and release my thoughts I probably would have kept them all bottled up inside. Something many people do, but it is definitely not a healthy way to deal with your thoughts and feelings. 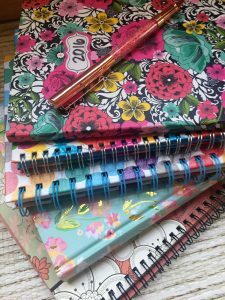 I never realized when I began journaling in my teen years how therapeutic it would be for me in my adult years. I am thankful I began the habit early on in life because it has served me much good so far. As I grow older, I know I will only appreciate the process more and I plan to pass the tradition down to my children. There are some habits that are hard to develop, others that are hard to break, but this one is definitely one I’m glad I took the time to begin. Today’s Prayer Journaling Prompt: Write about your values and beliefs. What do you treasure and hold dear? What are the most important values that you hold? 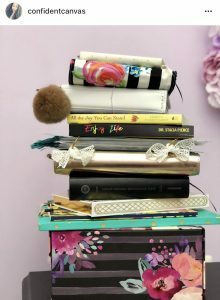 You might want to purchase the 30 Days of Prayer Journaling Prompts Journal to aid you in being successful in starting the process of journaling. 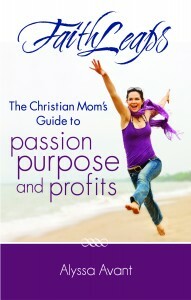 You can purchase it in downloadable PDF or Paperback. 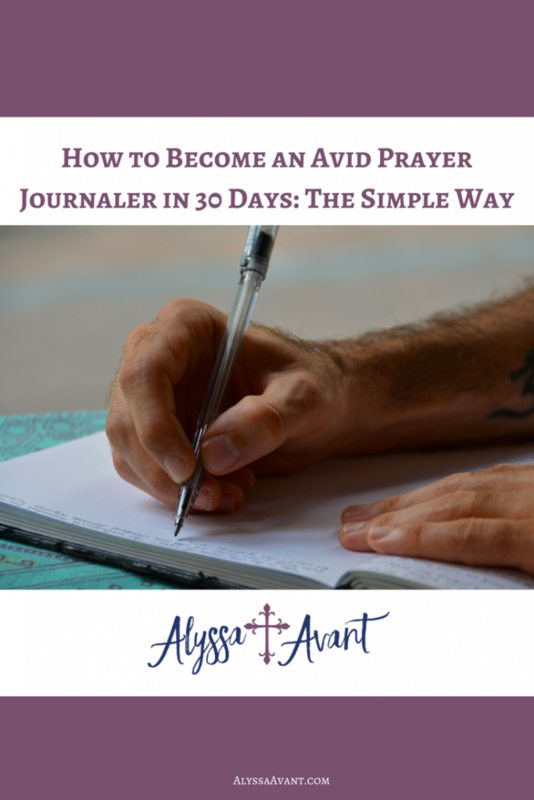 Join me over the next 30 days to become an avid prayer journaler. 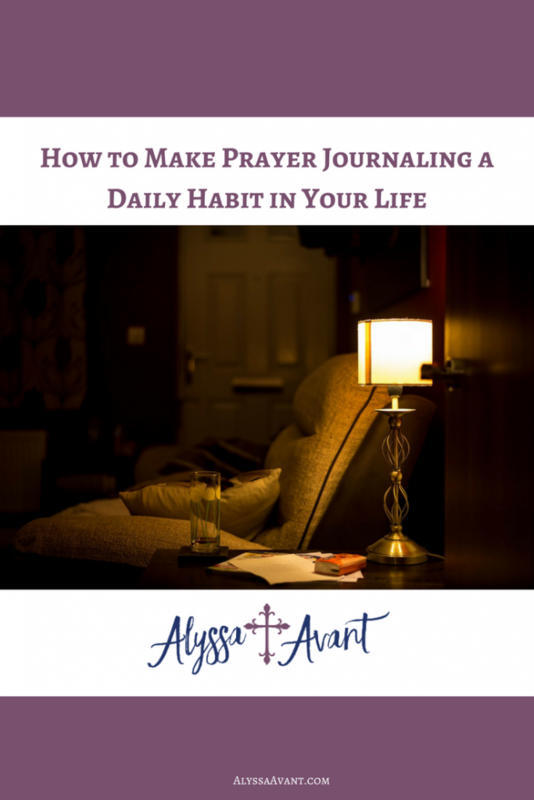 This series will help you to develop the habit of prayer journaling daily. 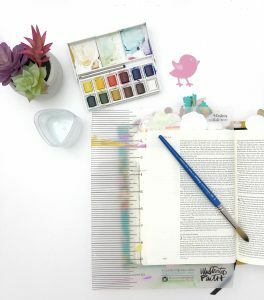 Research shows that it takes a person 21-30 days to develop a new habit, so therefore this 30-day series should help get you on your way to making prayer journaling a part of your daily routine. Each day for 30 days I will be sharing with you a prayer journaling prompt. 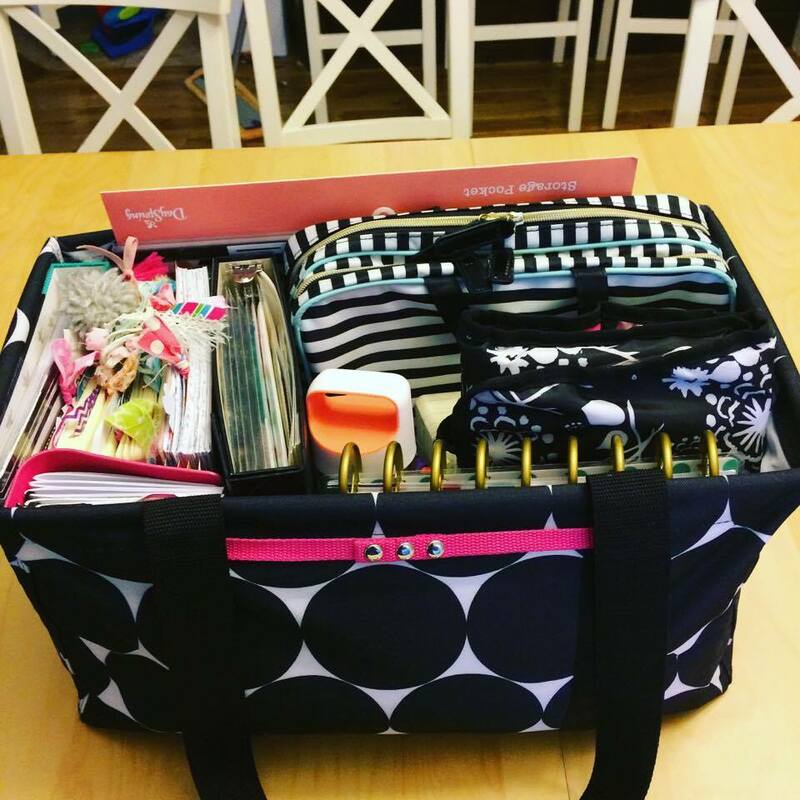 You will have everything you need to get started prayer journaling immediately and I will be here to cheer you on! So, what are you waiting for? 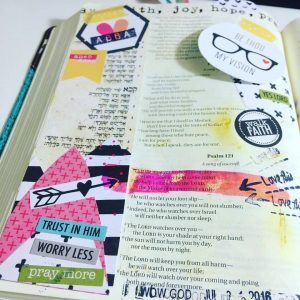 Why Should I Become a Prayer Journaler? 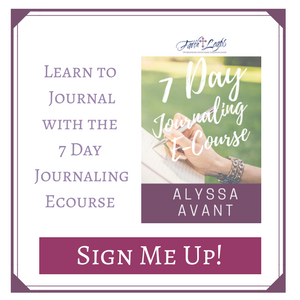 Journaling allows you to get rid of some of the thoughts that are cluttering your mind and the stress that is cluttering your life. There is something about putting it all on paper that is almost like going to counseling, it just HELPS. 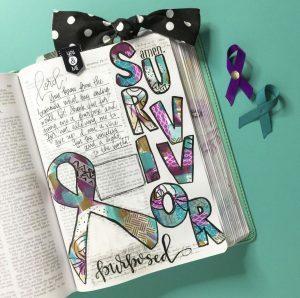 You might journal about the prayer journaling prompt given, about something that you are struggling with in life, or something that you want to remember as a victory. In addition, you will want to also include your prayers. You may choose to make lists or write out a prayer almost like writing a letter to God. When you are journaling do not feel like you have to write perfect, use correct language or grammar. Just write. It is the process of getting your thoughts from your head onto the paper that is important. Setting aside time to write in your journal is another important key to developing the habit of journaling. The time you set aside needs to be uninterrupted, quiet time, preferably when you are alone, alert, awake, and ready to write. Journaling is important because it serves as a record of your thoughts, your goals, and your dreams. It can be looked back on to remind you of your trials, your tests, and your circumstances, allowing you to look back on your past and remember where you came from, what you’ve gone through and how you came out on the other side. 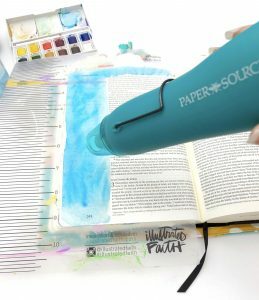 So grab a journal, a pencil or your favorite pen and get ready to begin your journey of becoming an avid prayer journaler. Today’s Prayer Journaling Prompt: Journal about your memories, old memories or new ones, or even those you hope to make in the future. 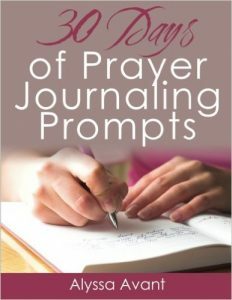 You might be interested in purchasing the 30 Days of Prayer Journaling Prompts journal to go along with this series. 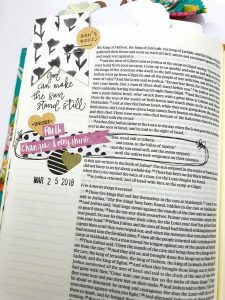 Today’s guest Bible Journaler is Ana Willis. I have known Ana online for a long time. She is such an inspirational person in many areas of life. I am thrilled to have her as a part of this party helping me wrap it up on this the last day. 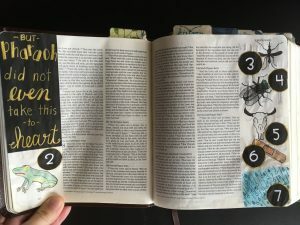 Bible journaling came to me in one of the deepest and darkest season of my life about three years ago. And I’m so glad I found it! After years of full-time ministry as a pastor, I burned out completely. 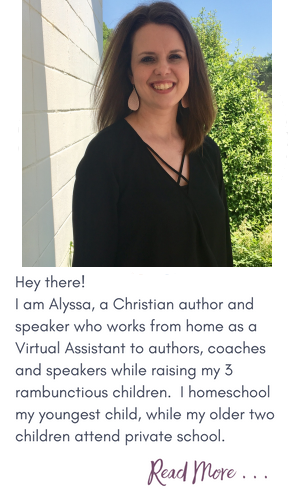 For years, I dragged myself around exhausted juggling between working in two churches, homeschooling my three kids, and growing my online business as a certified health coach for about 3 years. As a pastor and health coach, I took care of hundreds of people while neglecting myself completely. Stress made me sicker and sicker. My body was shutting down and I started to have panic attacks. I ended up in and out of the hospital and of doctor’s offices until the worse happened. One day, coming home from the library with my kids, I began to have chest pains and shortness of breath. I managed to drive home praying the whole time for God to protect us. As soon as we arrived home, my husband called 911. For three and a half hours, I was paralyzed from head to toe. I couldn’t move or speak. After spending the night in critical care, my doctor concluded that what I had was a major panic attack and I should step back from work completely to heal from stress and anxiety. We were not prepared for that. I felt like a failure in every possible way. “Did I do something to lose my calling?“, I questioned God. Guilty and shame took over me. My burnout cost us much more than I could ever imagine. We had to live with less than half of our previous income putting us in a very difficult financial situation and with that, I became very depressed. It was truly the worse time of my life. 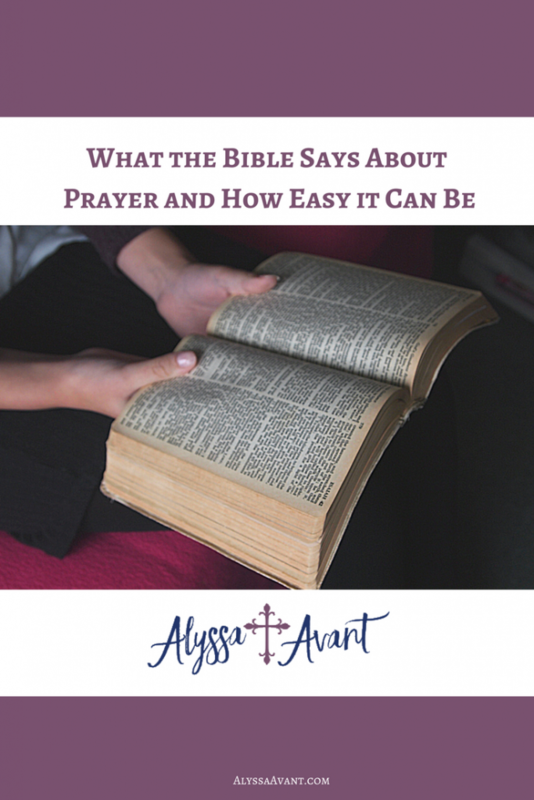 I couldn’t pray or read my Bible. I felt so distant from God. 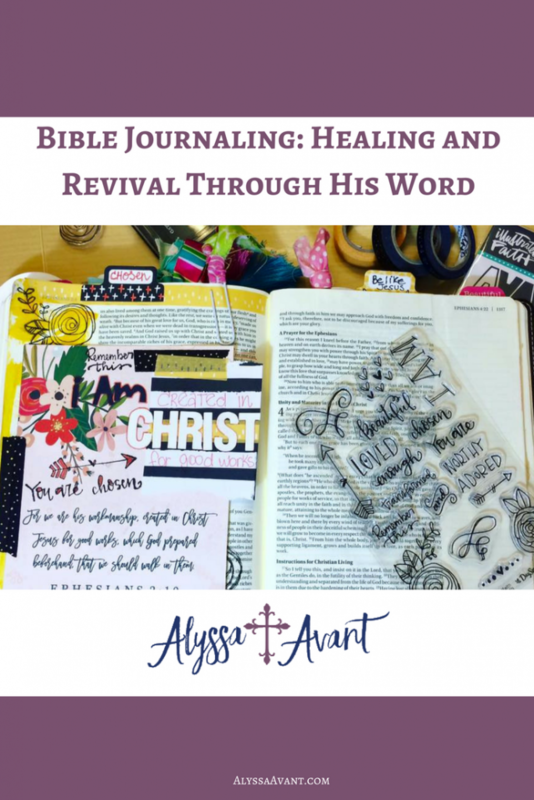 It was then that I found Bible journaling and began to copy Scriptures to a journal. Suddenly, God’s Word began to do the healing in me. I was able to abide again in The Word and it brought healing to my body, mind, soul, and spirit. 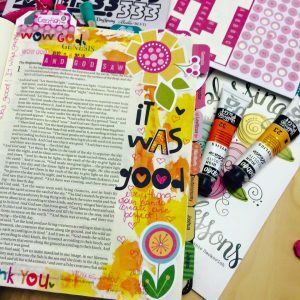 Bible journaling revived me! I fell in love with it. 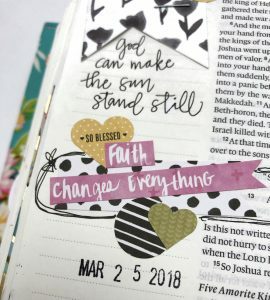 So much so I couldn’t stay quiet about it and began to teach a workshop on Bible journaling at our local Christian bookstore. Through these workshops, many other women were also revived in their faith. Praise God! 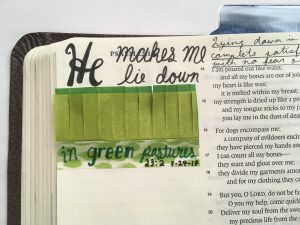 My favorite thing about Bible journaling is how it allows me to create memorial pages I can go back to and remember exactly where I was, how and what God spoke to me that day. These pages in my Bible are where His Words and my words merge, and it doesn’t matter how it looks like. It’s all about the holy moments I spend in His presence. 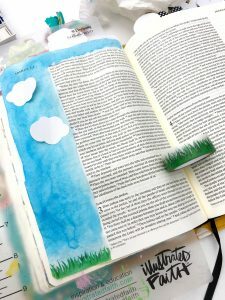 I also use Bible journaling with my kids in our homeschool. It has been amazing to see their spiritual growth through it. You are never too young or too old to start it and you don’t have to be an artist either. 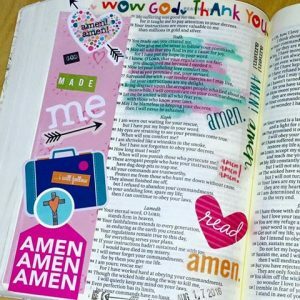 Bible journaling in our homeschool. Paint and letter stickers! Oh, they make everything look pretty, no matter what. I love washi tapes and cutouts too. 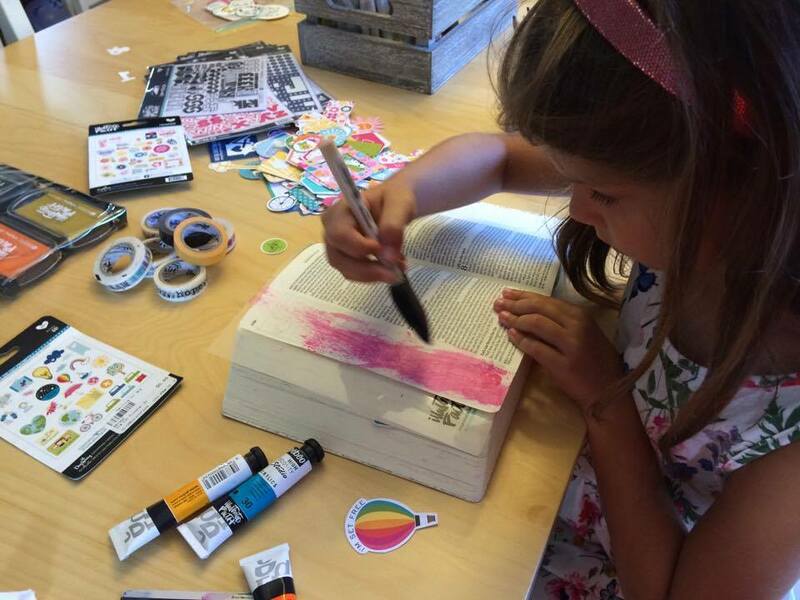 Stickers, stamps… you name it! But smashed paint and letter stickers are my favorite tools. I journal in a journaling Bible. Currently, I’m using an NIV Holy Bible journal edition from Zondervan but I didn’t start it there. I used a regular journal with some pretty flowers around the pages when I first began and a black marker. It was all I had and all I needed. 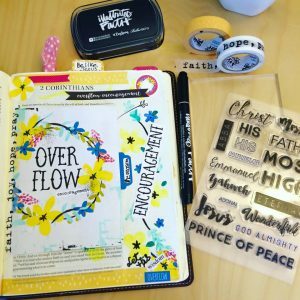 Today I have a lot of Bible journaling resources. LOL. 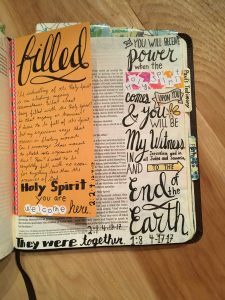 Bible journaling in the beginning. Honestly, I don’t have a favorite technique, but I do have a favorite tip. Washi tapes can make a super cool background when you don’t have any paint around. 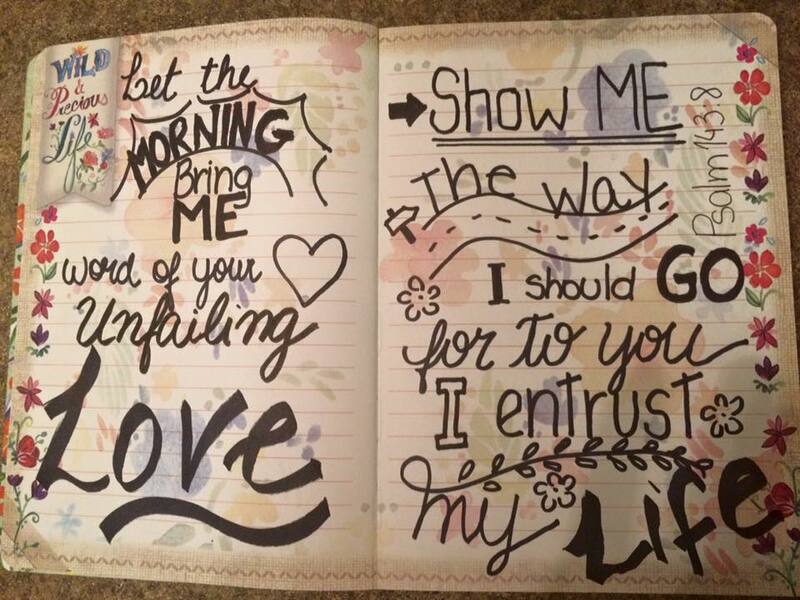 Just put some worship on, invite the Holy Spirit to teach you and let His hand guide you through your journaling time. Don’t focus on how you want to look like, just focus on His voice and the message He is speaking to you about. 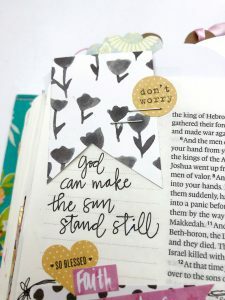 My Bible journaling pages today. 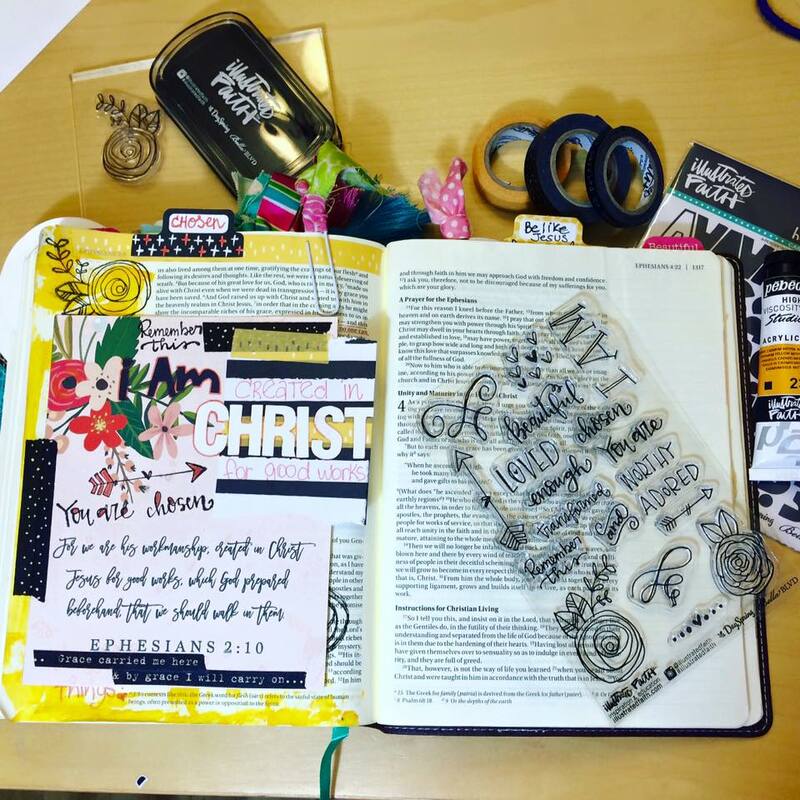 Today’s guest Bible journaler is Rachel Cheyne. 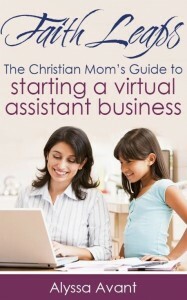 I connected with Rachel in a Facebook group for Christian bloggers. 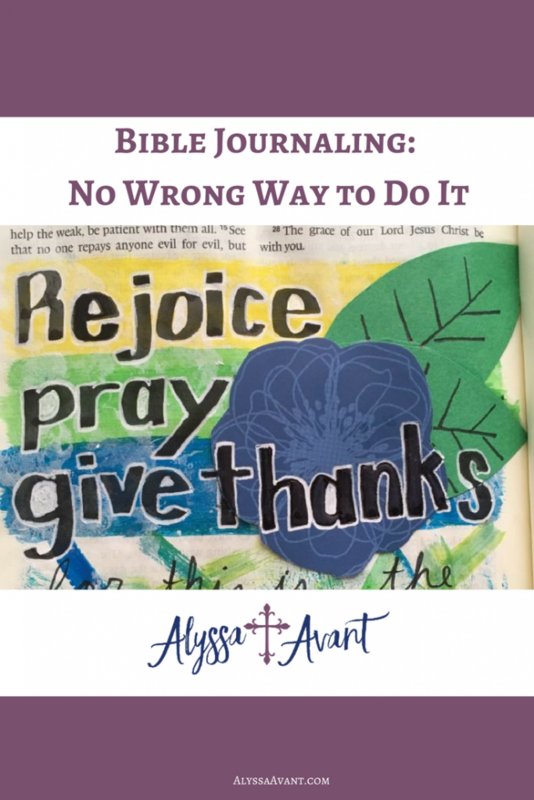 I’m excited for you to read about her Bible journaling journey. She and I have similar journeys. 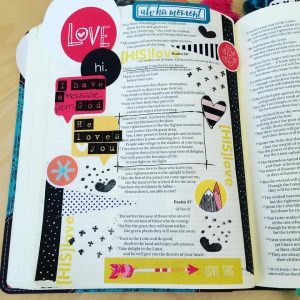 About three years ago, I found #biblejournaling on Instagram, and I was immediately intrigued. Shortly thereafter, I began art journaling during my quiet time with a pen and colored pencils in a tiny notebook. As a visual learner, this simple start helped me to remember what I was reading and to have a record of what the Lord was teaching me. 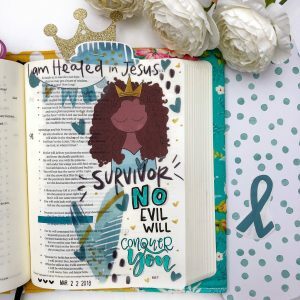 I received a journaling Bible for Christmas in 2017, and I became much more consistent and elaborate in documenting my faith visually. I started with a black gel pen and those same colored pencils, but before long, I was adding washi tape, stickers, watercolor, and I had amassed a variety of drawing pens. 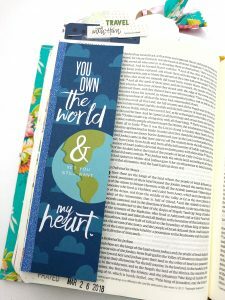 My favorite thing about Bible journaling is the legacy of faith that will be left for my children on the pages of my Bible. I love thinking about what my Bible will mean to them as they read the notes and see what God taught me through and for them. I also pray that evidence of my faith will be a tangible encouragement even when I am not physically present. 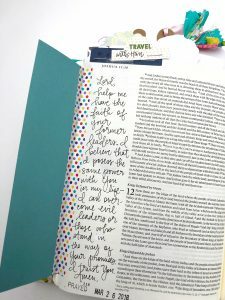 Most of my journaling is what I would refer to as “mixed media in the margins”, so I use a wide variety of tools and supplies, but a good white gel pen has been a game changer for me. It works well for covering mistakes, but it also makes hand lettering pop. 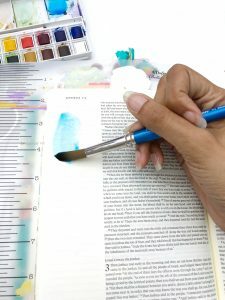 I also use it to create subtle texture in drawings. I struggle with being too critical of my work, and having an easy solution has allowed me to forgive myself for making mistakes as I learn. I keep a variety of supplies on my desk, so I can grab whatever sparks my interest on a given day. I love washi tape (Who doesn’t? ), scrapbooking stickers, pretty paper, and watercolor pencils. I even have a mixed jar of sparkles and sequins that I adhere with glue to add a little pizzazz to finished pages. Because of this varied approach, it is a little difficult for me to describe a favorite technique. I guess my favorite technique is mixing multiple styles. 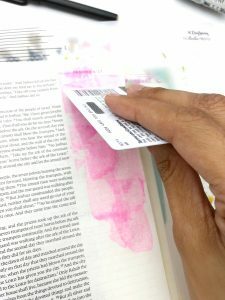 I am not comfortable with covering the text, so my artwork stays in the margins or is very faint when it stretches into the printed scriptures. However, I do not feel that this stipulation has limited me. I have been quite adventurous with techniques and materials, and I enjoy flipping through this colorful record of my growth in the past 15-ish months.